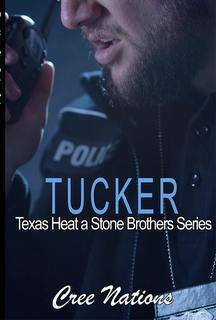 Tucker Stone never wanted to be Sheriff. He's just a man and he wasn't looking for a relationship. Yet here he is wearing a Silver Star on his vest, a gun on his hip - and a woman that's nothing but trouble upstairs shackled to his bed. He could always take off the badge, and hang his gun up - at least temporarily. But the woman in his bed was an entirely different matter. For the first time ever he just might decide to keep her - at least then she'd be his...TROUBLE. After the Stone family takes back their town, Tucker is basically forced to take on the role of sheriff. He didn't ask for this and sure as hell doesn't want it. Keegan and Tucker meet and have a world of secrets between them.. This is the second book that I've read by Cree Nations. Although the storyline is good, the same issues remain from the first one. The multiple POV's make the book busy and difficult to follow. The spelling and grammatical errors are distracting. Combined with a shifting timeline, which interrupts the pacing and flow, this book needs some work. Similar to the first book, this one has potential, but is let down in the execution. Release Day Blitz! Trinity by M. Never. Cover Reveal! Rock the City by Gia Riley.